Good evening from the final moonlit hours of Labor Day! I usually take holidays off from blogging, but I wanted to put this little post up about a cool project I’m doing this month. 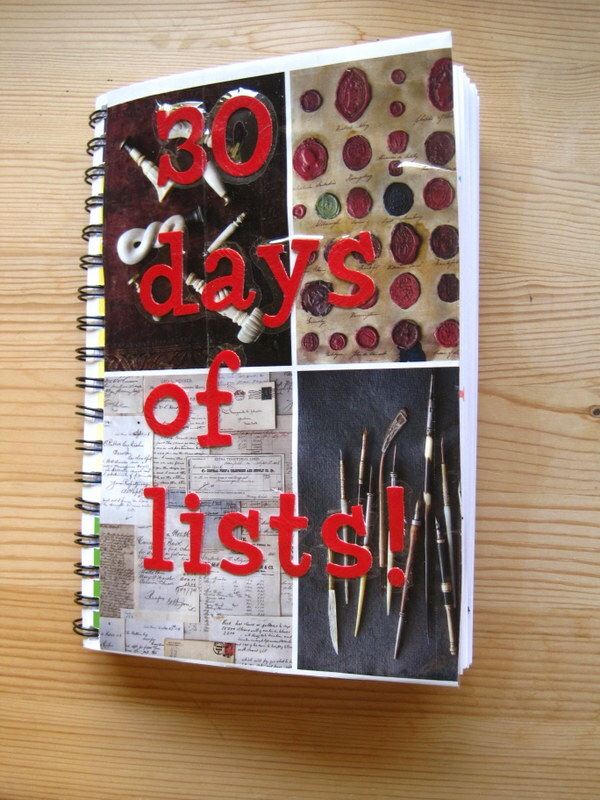 I had heard about 30 Days of Lists in passing for a while, but this time, I decided to try it. The idea is very simple: list topics are released each day for a month, and you make your list. 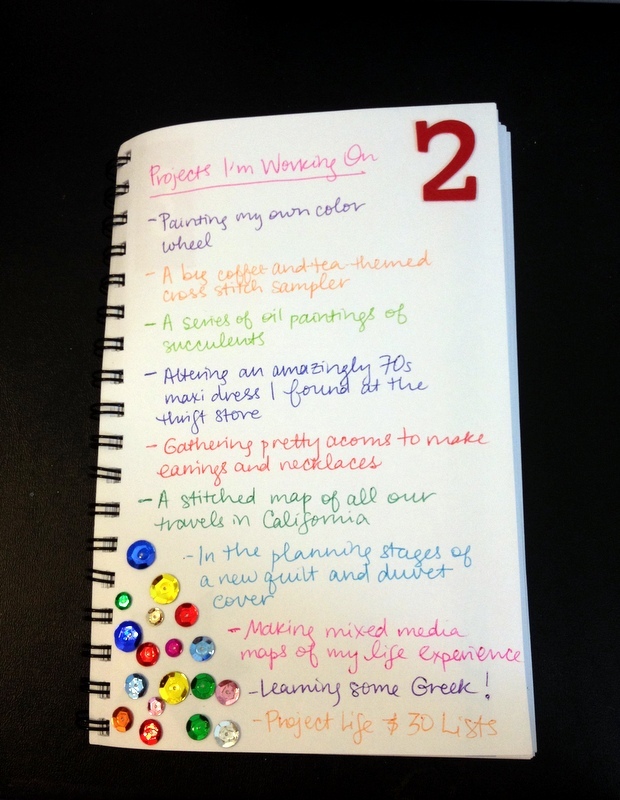 You can write your lists anywhere you like, from post-it notes to journals to customized notebooks. You can make this project whatever you want it to be, and do it however works best for you. I was drawn to the idea like a moth to a flame because I am a lister through and through. When Eric and I first started dating, we marveled at each other’s penchant for listing. I swooned over his list of books to read and his hipster PDA, and he liked my lists of fun stuff to do, tacked up all over my house. At one point we were in a bookstore, and we found a book for recording your relationship in lists. Eric read out one of the prompts, “Describe your ideal mate,” and, not missing a beat, answered, “Number one. 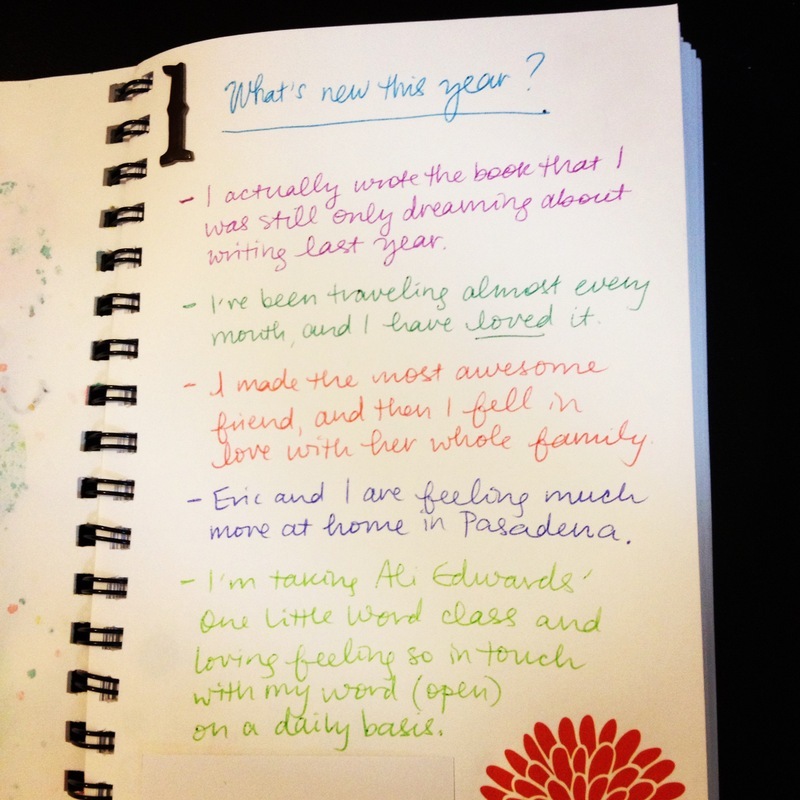 Loves lists.” This is probably as good a juncture as any to use the hashtag #NerdsInLove. But back to the business at hand: this is just a cheap Walgreens sketchbook covered in my most favorite manner: with a pretty page ripped out of a magazine, topped with a few stickers and sealed with packing tape. I keep it classy over here. 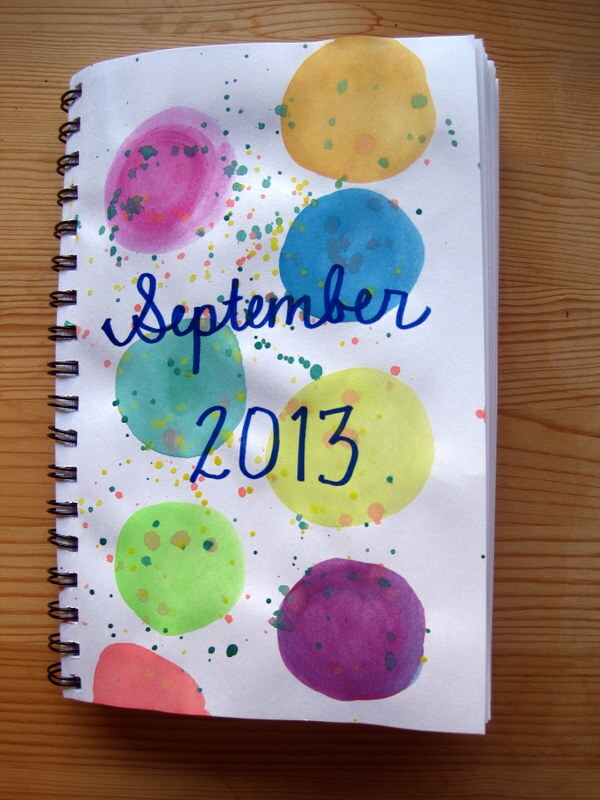 This is my title page, made with my shiny new watercolors. I decorated the pages very simply, with numbers and stuff from the scrapbooking supply my sweet friend Michele gave me. It’s worth noting that almost all of my scrapbook stuff was a super generous gift from her: thank you! This is the first day’s list, and I’ll always remember this blurry picture as the last thing I did in my sunburned and salt-swept daze after spending the happiest day at the beach. This is today’s list, which I loved! I am working on eleventy billion projects at any given moment, so I just chose the ones that were within my line of sight. I have to say that one of the most fun things about this project is seeing everyone else’s lists. You can easily find them on Twitter or Instagram by searching the hashtag #30Lists. It’s not too late to join! Please let me know if you do! Your day 3 list (posted on Instagram) is indeed powerful. I mentioned it to Mom over lunch, and we shared a little about how we might fill out our own responses to that question. It also occurred to me that today we are both our current self and the younger version of the self that we will become. That made me wonder what I would be writing to my 55-year-old self some day in the distant future. Thank you for the inspiration to look back as well as forward with a new set of eyes. Thank you so much, Dad! This is so sweet and really warmed my heart. One of the best things about ever having started this blog is the feeling that I get every now and again that I can be right around that table discussing all the things that matter most with you:) That is such a great insight! We will look back on this time as the past before too long. I would love to hear your answers to the question! Let’s put that on the docket for a cold December night at the farm:) Love you!